Water Ionizer JA-503 Kangen Ionized Water is one of the greatest preventative health advances and technological marvels of the 20th century, yet it has gone almost entirely unnoticed. It is a superior Hydrator and Detoxifier because Ionized Water molecule clusters have been "reduced" in size (from 10 to 5) and therefore is "lighter". Ionized Water's smaller size allows it to hydrate your body more effectively, pushing out toxins as it easily passes through your body's tissue. It comes with the Large 5-plate polymer ion-plated platinum coated titanium ionizing plates (est. life 20 yrs, latest Japanese University technology). It produces an Ionized Water of about 10.0 pH or higher, depending on your water source. Regarding quality and ionization strength, the PurePro Kangen Water Ionizer is comparable to any other water ionizer on the market. 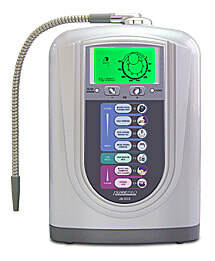 The revolutionary PurePro Kangen Water Ionizer was designed for the world market. PurePro Water Ionizer is now sold in the USA, Canada, Australia, New Zealand, Asia and Europe. PurePro offers you the very best in quality at an unbeatable price.